ESPN’s streaming service, ESPN Plus, arrived last year, ushering in what is sure to be a new era of content delivery for Disney-owned properties. 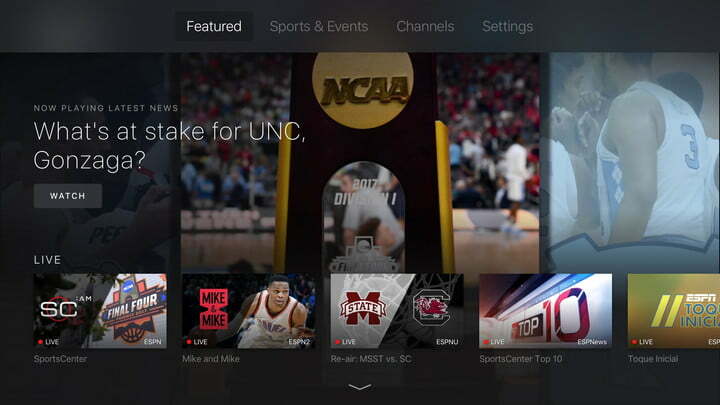 Before we list off the basics, though, we should start out by saying that, despite appearances, ESPN Plus is not a stand-alone streaming service, nor is it a replacement for your ESPN cable channel. Instead, ESPN Plus gives users a new, mobile way to access ESPN content and live programming through the updated ESPN app. The new service differs from other streaming apps in a few key ways. Here’s everything cord-cutting sports fans needs to know about ESPN Plus. For the first seven days, ESPN Plus won’t cost you a cent! There’s a free seven-day trial, so you can see if it’s right for you. If it is, there are two different subscription models — either $5 per month or $50 per year. While more expensive upfront, the yearly subscription model saves you $10 per year. Watching live ESPN channels will still require a paid TV subscription (whether from cable, satellite, or a live TV streaming service). The app acts as a gatekeeper by requiring users to sign in with their TV provider account to enable live viewing. If you need help finding a streaming TV provider, take a look at our live TV streaming services guide. If you decide the service isn’t meeting your needs, you can cancel your subscription at any time, no strings attached. The service includes live MLB, NHL, NBA, and MLS games, as well as college sports, PGA golf, Top Rank Boxing, and Grand Slam Tennis matches. You’ll also find United Soccer League, cricket, rugby, Canadian Football League, English Football League, and UEFA Nations League games. ESPN Plus is becoming a soccer fan’s best friend: In addition to the soccer content listed above, ESPN Plus has a multiyear deal with with the FA Cup — the oldest domestic cup tournament in the world — to stream English football matches in the U.S. The app gives you access to scores, news, sports radio, podcasts, an on-demand library, and certain games and programming not available on ESPN’s cable channels — plus there’s a condensed, digital version of the network’s popular SportsCenter roundup each day. It also enhances your existing sports subscriptions — if you happen to subscribe to another premium sports streaming service, like MLB.tv or NHL.tv, you’ll be able to access out-of-market games through the ESPN app. WHAT ABOUT THE VIEWING EXPERIENCE? Critically for sports content, video can be streamed at up to 60 frames per second, though this will increase your data charges if you’re watching over a mobile connection. Unfortunately, one area where ESPN Plus is a lot like its cable channel sibling is advertising. Despite the subscription model, you’ll still encounter a limited number of ads while watching live programming. On the bright side, if you happen to miss the first part of a game, you can watch live content from the beginning, even if you start watching late. The ESPN app is available on almost every device and platform we can think of, including Android smartphones, Android TV, Chromecast, Fire TV, Fire TV Stick, Fire TV Cube, Fire TV Smart TVs, Fire/Kindle tablets, Apple TV, iPhone, iPad, Roku, Oculus Go, Xbox One, PlayStation 4, and Samsung Smart TVs. With any luck, platforms like LG’s WebOS, and Vizio’s SmartCast will be added soon, but Vizio owners can use their TV’s built-in Chromecast function for now. That’s the quick-and-easy rundown of ESPN Plus and its features. The service is sure to evolve as time goes on, and we’ll keep you updated with all the important additions and changes. You can find out more about ESPN Plus on the ESPN Media Zone website. Users of iOS devices can download the ESPN app via iTunes, while Android users will find it on the Play Store.